The BMW 5 Series is the benchmark against which all executive cars are judged, so we tend to hold it to some pretty stringent standards. Most of the time it's been able to live up to expectations, but there has been the occasional blip along the way. The 'F10' generation 5 Series, launched in 2010, was the sixth iteration of the 5 Series, continuing a bloodline that began way back in 1972. It marked a stunning return to form and it needed to given the emerging excellence of its rivals. As a used buy it stands up extremely well. Here's what to look for from the models built from launch to its first facelift in 2013. It's probably fair to say that this car's predecessor, the E60 5 Series, didn't find universal favour. In its defence, the initially odd-looking styling was probably ahead of its time, becoming far more accepted as time went by, but this was a car which majored on big power and aggressive driving dynamics at a time when the market had turned to favour high economy and low emissions, light weight and efficiency. 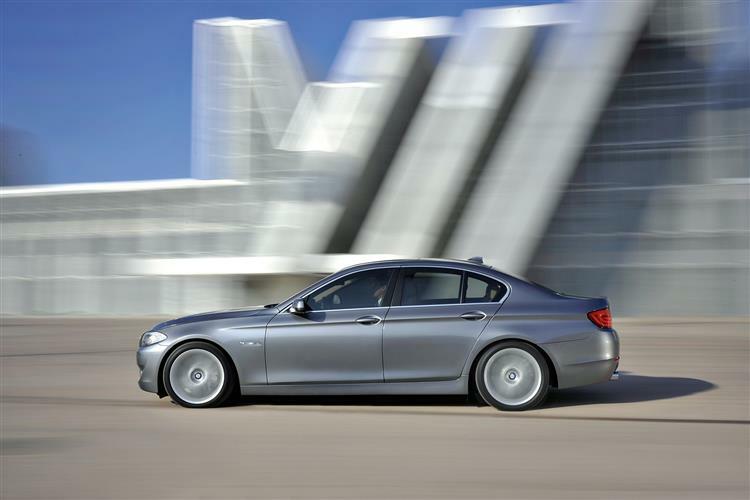 With the F10 5 Series, BMW set out to show that providing luxury, elegance, space, refinement, efficiency and an exciting drive in one package wasn't an impossible task. It needed to as well, as Mercedes-Benz had massively upped its game with the E Class and Audi, Lexus and Jaguar were hardly slacking either. Jacek Fr?ehlich's more conservative design met with approval when it was first aired at the Geneva Motor Show in Spring 2010. Initially the range was quite limited, with BMW's September 2010 launch including 520d, 523i and 550i saloons and estates. 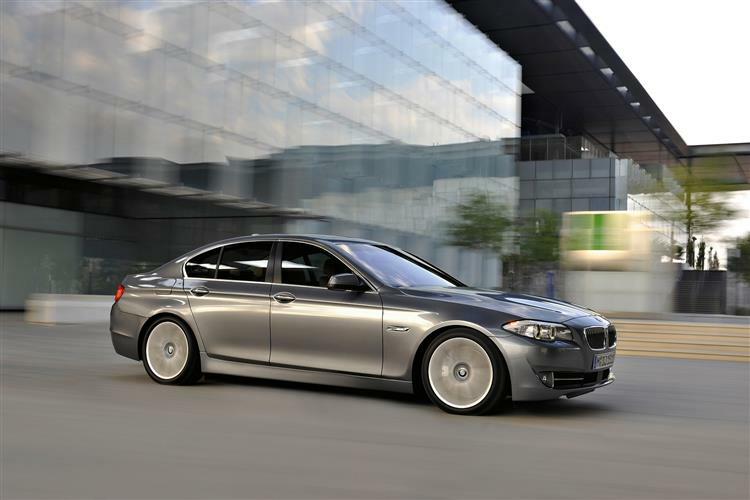 October 2010 saw the phasing in of M Sport models across the range, as well as 525d and 535d diesels and the 528i 3.0-litre petrol unit. 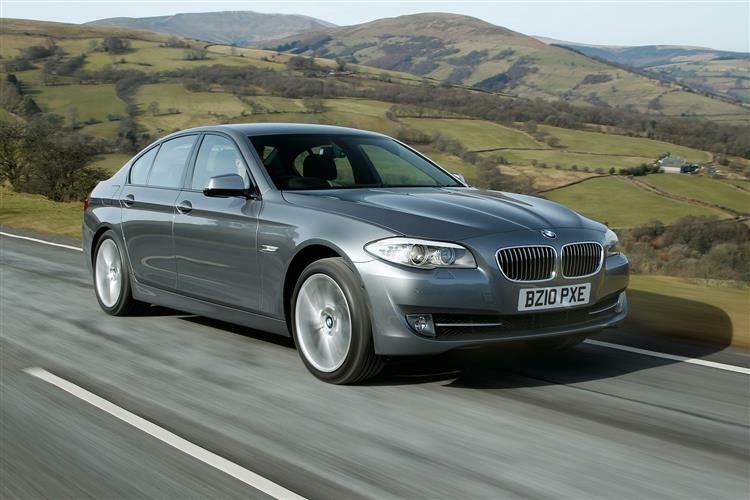 The 62.8mpg 520d EfficientDynamics saloon was introduced in October 2011 and the range was augmented with the addition of the thunderous M5 in November 2011, the first car to wear such a badge that featured a turbocharger under the bonnet. 2012 saw the introduction of the ActiveHybrid5 model, which was also then offered in M Sport specification. All Touring versions were revised in June with automatic tailgate operation as standard, while all 5 Series variants gained Voice Control at no additional cost. The range enjoyed a light facelift in 2013 with incremental efficiency gains made across the board. BMW deliberately steered away from the controversial design that marked the E60 generation 5 Series and this F10 model is a clean, non-radical but nonetheless elegant piece of styling. The low profile nose tapers to an almost vertical front grill while the scalloped bonnet contours and swage lines that striate the flanks are as close as it gets to standout features. The wheels are pushed right out to the corners of the car, creating very short overhangs front and rear and a planted stance. The expanded wheelbase is made to count inside where there's lots of rear passenger space, including an extra 13mm of knee-room compared to the E60 model. The seats split 40:20:40 and fold down but even without them lowered, 520-litres of capacity is on offer at the back. The design of the cabin throws up few surprises, with much of the switchgear being similar to items seen before on BMW's larger cars. The minimal design is appealing and there's still a button for all the important functions with only the more peripheral stuff accessed through the iDrive menu system. The modern, high quality feel works very well but the multifarious chimes, bongs and pings that sound when you've forgotten to do something can become maddening. To some eyes, the Touring estate will be a more attractive car than the saloon but most buying decisions will still hinge around what extra practicality that boot space can offer. At 560-litres, the Touring has 60-litres more luggage capacity than the saloon and its space is accessed through a wide, high lifting tailgate. The rear window also opens automatically in a feature we're more used to seeing on 4x4s. This means smaller items can be dropped in without raising the big back door in its entirety. The rear seats are split 40/20/40 and drop down flat to the floor for a 1,670-litre capacity. There's also extra versatility courtesy of the Extended Storage option which includes rear seat backs that can be positioned more vertically to add an extra 30-litres behind. This option pack also adds rails, nets and other load securing options inside. No significant problems have yet to be reported with the F10 5 Series, although minor niggles such as blown LED lights have been brought up. Be aware that the desirability of the car is very dependent on colour choice. Stick to safe silver, graphite or black and you shouldn't go too far wrong but some of the more colourful hues won't be so easy to sell on. Check the electronic functions work as some of these can be a very expensive fix. Also check the tyres for signs of uneven wear and look for kiddie damage in the back. (approx prices based on a 2011 550i ex VAT) An exchange starter motor retails at around £245, while a windscreen will set you back around £350. Expect to fork out £475 for an exchange alternator while front brake pads cost a hefty £150. An entire headlamp pod will relieve you of £375. Replacement xenon bulbs are £99 a pair. A criticism of the F10 5 Series at launch was that, in standard form, it didn't enjoy quite the sporting advantage over its rivals that its predecessor had, not least because of the switch to electric power steering over the feelsome old hydraulic set-up. That said, the new Five was significantly more luxurious and user-friendly and brought a peachy 8-speed auto to the party. Moreover, the electric steering offered owners a self-parking option would guide the car into the tightest space with the minimum of driver input. True, the chassis was polished, accomplished and comfortable - just a little uninvolving. Dialling in sporty driver-appeal meant ticking the box labelled Drive Dynamic Control on the options list (which allowed the driver to adjust the ride and handling characteristics). This rebooted much of the previous 5 Series' much lauded dynamic elan and presented something approaching a 'best of all worlds' scenario. Perhaps that was why, a year after launch, BMW decided to make this feature standard across the range. Still optional, though, was active steering which below 37mph steers the rear wheels very slightly in the opposite direction to the fronts, tightening the turning circle and improving low speed response. Above 37mph, the rear wheels turn in the same direction as the fronts. Add this to the standard DDC and you get a car that really comes alive. 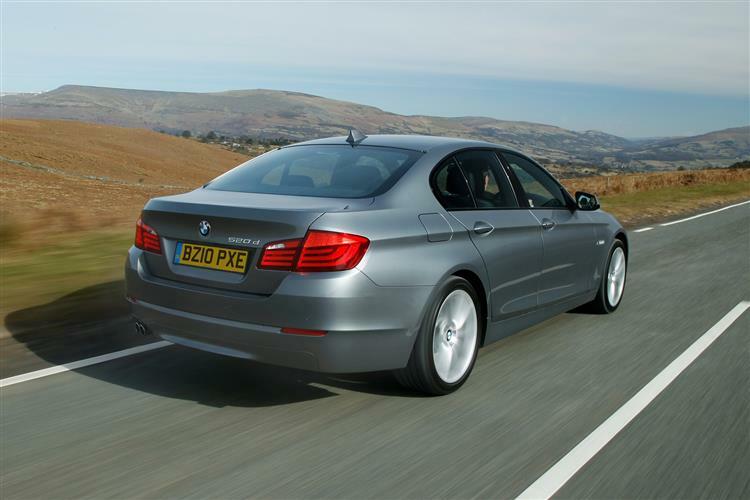 Power for most customers will come from the 242bhp 3.0-litre 530d diesel. But if you want to be a step more virtuous yet still engage fully with the Five as one interpretation of the 'ultimate driving experience', the lower-powered 520d ordered with BMW's top (M Sport) trim level maybe just the compromise you're looking for. After all, with a 0-62mph time of 8.1s and 141mph top speed, it isn't as if the 184bhp 520d is a car on which the M Sport treatment would be wasted. The most sharply focused trim level brings lowered and stiffened suspension, an aero body kit, 18-inch M Sport alloy wheels and aluminium trim accents in the cabin. The shorter-throw gearshift and sports steering wheel add to the feel-good tally. It even looks a bit like the 552bhp M5. 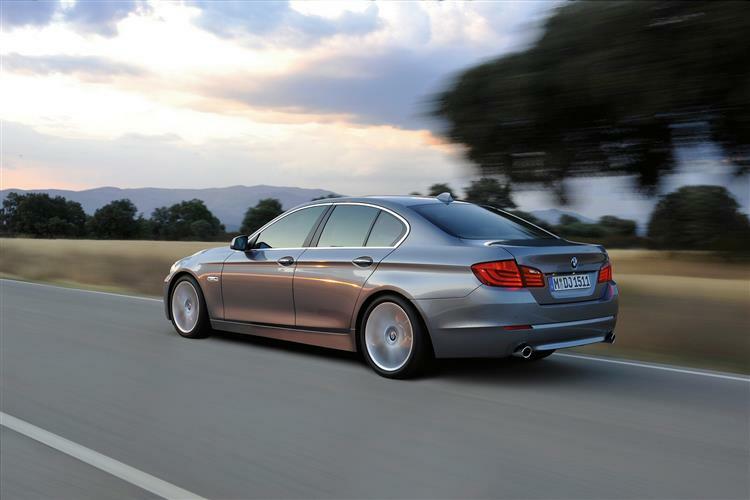 The sixth generation BMW 5 Series got off to a low key start but its subtlety is perhaps its greatest asset. There's a self confidence about this car that eschews the need for look-at-me excess. Everything just quietly works. As a used proposition it's just as convincing as new. The diesel engines can shrug off big mileages and no significant reliability issues have arisen. The 550i is possibly the only weak link in the range. Other than that it's a case of buy with confidence and enjoy.